A study by engineers from the University of Maryland’s A. James Clark School of Engineering has shown that using windows made of transparent wood, rather than glass, could provide consistent and even natural lighting and improved energy efficiency. The study was led by UMD’s Department of Materials Science and Engineering and the Energy Research Center’s Liangbing Hu. The study, which was published in the peer-reviewed journal Advanced Energy Materials, states that transparent wood lets in almost as much light as glass and also allows for improved thermal insulation. It also offers consistent and even indoor lighting and eliminates glare. The results of the study further the team’s earlier published research on the development of transparent wood. 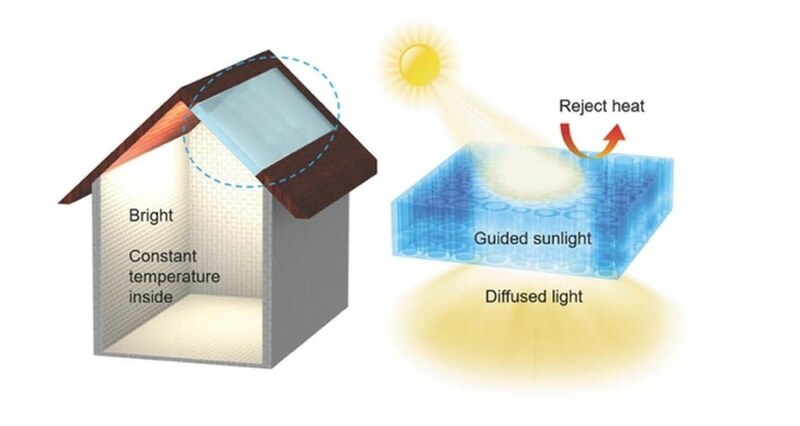 The lead author of the research, Tian Li, said that the amount of light let in by the transparent wood is just a little less than that let through by glass. It is very transparent, but still allows for a little bit of privacy because it is not completely see-through. We also learned that the channels in the wood transmit light with wavelengths around the range of the wavelengths of visible light, but that it blocks the wavelengths that carry mostly heat. The team built and examined small house models with a transparent wood panel in the ceiling, based on which the results were drawn. The results showed that the light let in through the transparent wood was more uniformly distributed than that let in through glass. The wood, consisting of channels, directs visible light via the material, however, the remaining cell structure slightly bounces the light around. This process is called haze. As a result of haze, the light, instead of directly shining into a person’s eyes, is more comfortable to gaze at. The researchers clicked a picture of the cell structure of transparent wood in UMD’s Advanced Imaging and Microscopy (AIM) Lab. The transparent wood has the same cell structure of the original piece of wood. The wood is cut against the grain in such a way that the channels that absorbs nutrients and water from the roots are along the shortest side of the window. The sunlight is directed in, via these channels, by the transparent wood. Glass windows change the angle at which sunlight shines inside a house according to the movement of the sun. Panels and windows made of transparent wood do not change the angle in which sunlight falls with the movement of the sun, directing it at the same angle at all times, unlike glass windows and panels. This means your cat would not have to get up out of its nice patch of sunlight every few minutes and move over. The sunlight would stay in the same place. Also, the room would be more equally lighted at all times. The researchers stated that operating with transparent wood is the same as working with natural wood. The polymer component of the transparent wood, however, makes it waterproof. Moreover, due to the resistance of the cell structure the transparent wood is less susceptible to breaking when compared with glass. Recently, the team acquired the patent for their transparent wood making process. The first step of the process is bleaching the lignin, which is the component that contributes to the wood’s strength and brown appearance. The next step involves soaking the wood in epoxy to restore the lost strength and make it clearer. Though the researchers have only used small pieces of linden wood measuring approximately 2 cm x 2 cm, they said that the wood can be of any size.